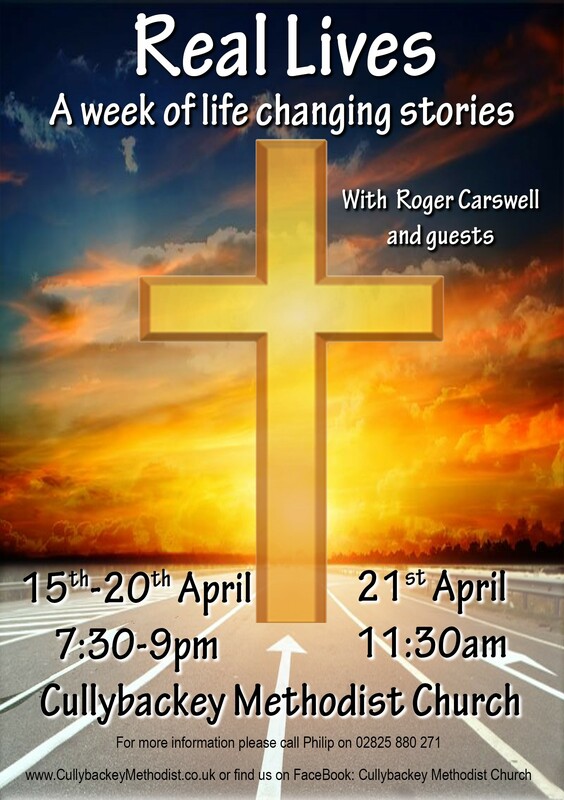 You are invited to Real Lives – ‘a week of life changing stories’, taking place at Cullybackey Methodist Church from Monday 15th to Sunday 21st April 2019. The meetings from Monday through to Saturday will run from 7:30pm-9pm. Sunday’s final meeting takes place at 11:30am. English evangelist, Roger Carswell, will lead the event. In addition to his nightly message from God’s Word, Roger is also looking forward to interviewing a different guest each night. Each one will testify to the Lord’s impact on their ‘real lives’. From Monday 15th until Saturday 20th April a ‘Disciple Me’ kids club will run concurrently with the mission between 7.30pm-9pm. This is open to children of primary school age and will take place in the Youth Hall at Cullybackey Methodist Church. – come and listen to a week of life changing stories. Read more information about the Real Lives Easter event on the Cullybackey Methodist blog here. Click here to go to Roger Carswell’s website.